Looking back on my childhood, I draw the conclusion that my three sisters and I grew up in an almost Norman Rockwellian atmosphere. For contemporary young adults who are termed millennials and whose artistic skills and knowledge do not go beyond staying within the lines of an adult coloring book, Norman Rockwell was one of the most famous artists of the mid-twentieth century whose paintings depicted life in America with incredible realism and power. The Downing home was indeed Rockwellian, not in the sense that we lived in an area where the geography or the scenery was postcard perfect, but in the sense of the aura of peace and tranquility that a painting by Norman Rockwell inevitably presented. In the eyes of Norman Rockwell the view was always comfortable, quiet, serene, and safe, and he had an uncanny skill in capturing the essence of the best of the human spirit. "Quiet, serene, and safe" are terms we seldom hear in descriptions of American home life these days, and it's becoming increasingly difficult to locate examples of the "best of the human spirit." Throughout his adult life, my father worked hard to provide for his family. The tradition of the husband provider and the wife home keeper was embedded in the culture of the time, and my father was successful in providing his family a comfortable home. My mother took her home duties seriously, and none of us ever missed a home cooked meal or went to school wearing torn clothes. Though my father worked hard fifty weeks out of the year, he determinedly set aside at least two weeks every summer for our family to take a Vacation. I capitalize that word because to us kids it was more that just a trip; we were to travel to our version of Paradise on Earth…namely, Noel, Missouri. We had discovered this haven of happiness when Dad decided about 1950 to go back to his roots…at least as far as he could go. Though Dad was born in western Oklahoma, many of his older brothers and sisters had been born in southwestern Missouri and northwestern Arkansas. 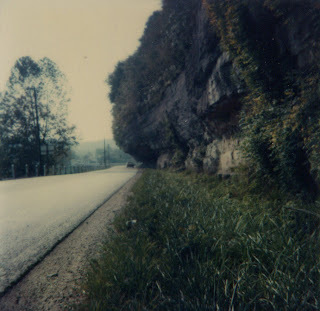 He had learned that many of his uncles and aunts still lived in that region of the Ozark Mountains, so, about 1950, we took our first vacation to the area to see how many old relatives he could find. He knew that his grandfather, Thomas Findlay Downing, had been a circuit riding preacher who traveled on horseback from town to town in the area preaching the gospel and saving sinners. Reverend Downing also hauled logs on wagons pulled by horses to earn a little more money to keep body and spirit together and eventually established a church just outside Southwest City, Missouri, where he pastored for several years. Years later, Dad ran across an old character in Pineville, Missouri, who remembered Preacher Downing and stated that he had admired Preacher Downing because “he was the only preacher who would walk into a bar through the front door…all the rest of the preachers snuck in the back.” Apparently the ministerial expectations were somewhat more relaxed back then. Anyway, on this summer day in 1950, we cruised into Noel, Missouri, in our black 1949 Mercury. Noel was then a sleepy town of about 800 inhabitants. Its main claim to fame was Elk River, which passed through Noel on its way to Lake of the Cherokees in Oklahoma. In this far northwestern edge of the Ozarks, the rivers are fed by underground springs, and the water, moving with a current that can be slow to near-rapids, is cool and clear. 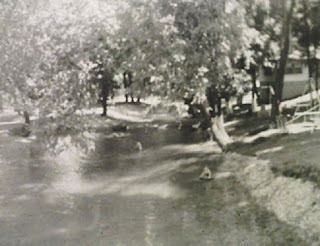 Because a dam had been built across the river just downstream from Noel in the twenties in an attempt to generate electricity, the river backed up so that the waters through Noel were fairly deep. In fact, to this day the two mile or so stretch through Noel is called Shadow Lake. In the thirties and forties, the Noel townspeople begin to exploit this natural treasure, and, by the time we arrived there in the summer of 1950, Noel was a bee hive of activity. (See photo) To add to the scenic nature, there were majestic bluffs which overhung the river, and when several roads were cut through these bluffs, tourists came from far and near to drive their cars underneath these hanging bluffs and marvel at the engineering feats. We drove through the little town, and we kids got more excited by the minute as we saw swimmers, boaters, and other kids running and screaming like wild banshees. It had taken us nearly two days to get there from Baytown, so my sister and I were ready to take off like rockets. But Dad insisted we find a place of lodging to unpack and unwind, so we drove along U.S. Highway 71 looking for a place to light. We drove along the river for about a mile until we came to a place that would become a part of our lives for probably as long as any of us children live: Green Valley Courts. Now, I realize that the name is not very impressive. Today, to impress someone with your vacation plans, you have to mention Disneyworld, Hawaii, St. John, Fiji, or some other exotic spot. But things were not quite the same sixty-five years ago. When we kids rolled into the driveway of Green Valley Courts, it was as if we had died and gone straight to heaven. The courts themselves were individual log cabins, each with a swing. There was an actual modest valley, shaded with oaks and other tall trees, through which passed the most gorgeous stream or creek, whatever you wanted to call it, we had ever seen. Before we even went to register, our whole family bailed out of the car, and rushed down to the stream (our name for it) and stuck, first our hands, and then our feet into the water. The water was coming from a spring barely three miles away and was icy cold, rushing rapidly over smooth, round rocks with a burbling sound that was sublimely soothing. Many times in our later visits we would put a watermelon in the water overnight, and it would be wonderfully cold by the next morning. On this first visit, Dad barely had time to register and unpack before we were all back down to the water’s edge. For the next two weeks, Dad would drag us away from “our stream” while we visited his relatives, but we counted the minutes until we were back to our adopted home. In the years to follow, Dad would throw out suggestions for some other place for our vacation, but we always wound up in Noel. In 1959, Dad and Mom decided to go to Virginia instead (more relatives.) We drove three hard days and finally stopped in Bristol, Virginia (barely into Virginia), but we kids had moaned and groaned so much, that Dad finally asked us, “What do you want to do?” In unison, we yelled, “Noel!” We turned around and went back to Noel. Needless to say, over the years we’ve had many memorable times in Noel, but in 1957, an event took place that at the time didn’t seem like much, but it is actually the basis on which this little essay is established. 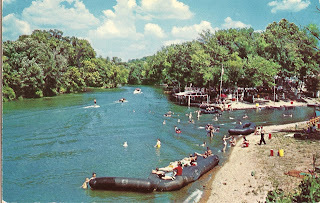 It was June of 1957, and as usual we were all in the stream’s water having a glorious time. Just about a hundred feet upstream from where we played was a bridge over which ran the road to Southwest City. On this particular day Dad and I wandered upstream to where we were beneath the concrete bridge. The stream with its bed of smooth, round rocks was a perfect resource for rock throwing, and we were constantly bouncing rocks off the water’s surface or at some target. For some reason, I picked up a rock and scraped the concrete support of the bridge. I found I could write as if I were holding a pencil! My mother had a mantra she firmly believed in: “Fools’ names and fools’ faces always appear in public places!” For some reason both Dad and I forgot Mom’s observation and we scraped our names and the date on the side of the bridge. 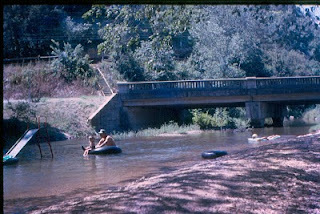 “Bobby Downing 6/27/57” “R L Downing 6/27/57” In a few minutes we lost interest and returned downstream to the rest of the family and enjoyed the rest of the day. In time we forgot about our actions. I was 14 years old and Dad was 39. Starting in 1950 and for nearly 30 years, Noel was a summer gathering place for our family. Eventually I had three sisters to compete with, and believe it or not, my wife and I spent our honeymoon at Green Valley Courts in 1961. In time our children came along, and both of them have made pilgrimages to Noel. Although Green Valley Courts disappeared in the seventies after being converted to small apartments, we continued to visit Noel, although we had to stay in “less satisfactory” accommodation…i.e. no stream to play in. In the mid seventies, my family moved to Wyoming and lived there seventeen years until my dad died in 1990, and we returned to Texas to care for my mom. During the eighties and nineties Noel took a turn for the worse primarily because Tyson Foods built a huge chicken processing plant in Noel which ruined the river and attracted transients and illegals from miles afar to work for minimum wage in the chicken plant. Noel was no longer the safe haven of peace as before. The last time I visited Noel, three years ago, there were heavily shrouded, masked women walking the sidewalks, cafes advertising "Genuine African Cuisine!" and suspicious sorts wearing hoodies in ninety degree weather watching your moves. We have our memories, but Noel is no more. In 2007, my wife and I visited Branson, Missouri, which, of course, anyone over the age of sixty is required to visit sooner or later. After our stay, we scheduled ourselves to travel to Grove, Oklahoma, to visit my sister Kathy and her husband. To travel from Branson to Grove is a westerly trip, and, as luck would have it, we were to travel to within about ten miles of Noel. A pang of nostalgia struck me as I got closer to Noel, and, finally, at the last minute, I made a turn and drove the familiar road along the river to Noel. In fifty years the road had changed little, except it was no longer U.S. Highway 71, but a county highway. Highway 71 had long since been rerouted to bypass Noel, which destroyed the tourism business. Eventually we drove into Noel, and, whatever glamour was there earlier had already been washed away. Noel was a ghost of its lively past. After being depressed for ten minutes or so, we decided to drive on to Grove. As we were leaving, I suddenly realized that we were going to pass the site of the old Green Valley Courts, ...and then I remembered the bridge. After we drove over the bridge, I pulled the car off the road and stopped. To the right, where the fabled Green Valley Courts had sat, there were now decrepit trailers in the spaces where the log cabins had been. I’m sure Shirley thought I had lost my mind when I told her what I was going to do. I took my camera and tried to find a path down to the stream. By this time the stream was barely visible through the bushes, grass, and shrubbery. I also thought about water moccasins because they are plentiful in that area of the hills. Gingerly I climbed down the embankment to the water, and, finding no place to walk along the edge, I put my nice, white sneakers into the water and waded out. The water was just as cold and clear as I remembered. I was a little upstream of the bridge, so I waded down toward the concrete embankment, keeping a sharp eye for land or water varmints. I reached the bridge, walked underneath,...and looked up. Eventually, after taking a few photos, I came to the realization that I have been very fortunate. My childhood was the stuff of dreams….not wealth and riches, but rather a home with caring parents and loving sisters. We have gone our separate ways and now have our own families and dreams. I have been blessed with a wonderful wife, children, grandchildren, and even in-laws. We have created our own special places and memories. As F. Scott Fitzgerald wrote in his story The Great Gatsby, “You can’t go home again.” In 2012 I returned to the bridge; my name and my dad's name were still there...fifty five years after the event. And I was reminded....I have had a good life. Retired after years of teaching science and math in Pasadena ISD, Texas.. Before that, I did a little of everything: grocery clerk, roofer, six years military (USAF Intelligence, Russian language specialist), retail management (Sears), businessman (taxicabs, gas station, employment service), life insurance salesman ( for one week! ), real estate broker, new car sales manager, teacher. This blog is a narrative of my experiences over the last six decades, peppered occasionally with observations and opinions of no particular merit, except that they will be from my perspective with no intent to change, offend, nor harm anyone. (1) Note the date of posting next to the title (month/year). (2) Scroll to the Blog Archive below the index and CLICK ON THE ARROW POINTING TO YOUR CHOSEN YEAR. The months blogs were published that year will appear. (3)CLICK ON THE ARROW POINTING TO YOUR CHOSEN MONTH, and the titles of the blogs of that month will appear. (4)Click on the blog you wish to read. TO POST A COMMENT TO A BLOG, email robertdown2003@yahoo.com . If you wish to share a blog by providing a link on your own blog, Twitter, Facebook, or Google Buzz account, you may do so by clicking on the appropriate box at the end of each blog and following the instructions.